There can be no music without a bass. Musicians – and there have been many – have performed and recorded, so-called “bass-less projects”, but all but one or two remain just that: “bass-less”. All of the greatest music by musicians from Palestrina to Bach, Brahms and Beethoven, have written spectacular bass-line melodies. In Jazz music, before the advent of the contrabass – that brought the likes of Jimmy Blanton, Oscar Pettiford, Charles Mingus, Ray Brown, Scott LaFaro, Charlie Haden, Dave Holland and Don Thompson – the drum and the tuba brought weight, seriousness, dignity, and importance to the melodic lines, adding gravitas to the music’s (Roman) virtues of pietas, dignitas and virtus. 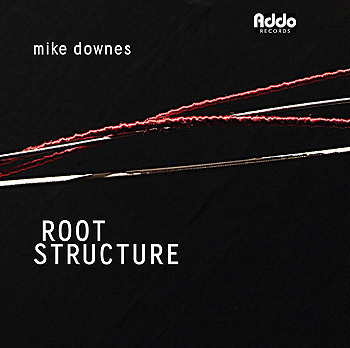 The contrabassist Mike Downes has always taken this very seriously and on Root Structure he makes a fine display of this and the fact that for a bassist, the title of this recording is most apt seems to spur Mr Downes further as he exerts an enormous influence on this music with unforced novelty and naturalness. Even more to the point, Mike Downes has new things to say and he says them with complete naturalness for there is nothing contrived or attention-seeking about his approach to this simply beautifully-written repertoire. Mr Downes’ traversal of the ten songs is spellbinding and for all the right reasons. Where many bassists dive headlong into the music, showboating as they negotiate pizzicato and arco gymnastics, Mr Downes is more measured, though he delivers plenty of virtuosity as the music unfolds. Despite initial appearances, he is not one for dragging tempos and even the famous Chopin Prelude (from Op.24) flows without a hint of indulgence. As far as his own music is concerned, Mike Downes displays the modernity of his thinking. For example he is superb in bringing out the often recessed harmonies in minor keys. For good measure Mike Downes is perfectly situated to execute this music with this band. Which bassist could have asked, for instance, to have a more brilliant drummer in his corner? Or what better way to lay your intellect on the line than with pianist Robi Botos and the now-seasoned guitarist, Ted Quinlan? Together with these stellar performers Mr Downes is able to strike a compelling balance between volatility and elegance. Each phrase feels carefully considered yet part of a bigger, cumulative picture, and the warm detail in Mr Downes’ articulation and touch is captured in superb sound by Steve Bellamy and Andre St. Denis, who enables the musicians to sum things up with the bassist’s forward-thinking vision. Track List: 1: Momentum; 2: Heart of the Matter; 3: Miles; 4: Moving Mountains; 5: The Raven; 6: Root Structure; 7: Flow; 8: Pre-Prelude; 9: Prelude and Variations; 10: Matter of the Heart. Personnel: Mike Downes: bass; Ted Quinlan: guitars; Robi Botos: piano and keyboards; Larnell Lewis: drums.